Many have yet to be introduced to Spinel's radiant beauty. Spinel has long been confused with other gemstones; the Black Prince's Ruby and the Timur Ruby in the Crown Jewels of Great Britain are really SpineIs! 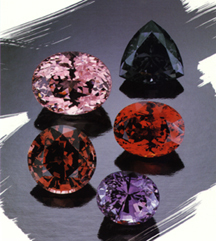 Among Spinel's other hues are pink, lavender, blue and mauve. Most gemstones, including diamond, need enhancement through cutting or treatment to be enjoyed as jewelry. Yet Spinel is one of the few gemstones that requires no treatment other than cutting to coax out its beauty. Though one of nature's most durable gemstones and an excellent choice for an active person, remove your Spinel before engaging in activities that may cause wear such as sports, housework and gardening. Spinel is the traditional gift for a couple celebrating their twenty-second wedding anniversary.